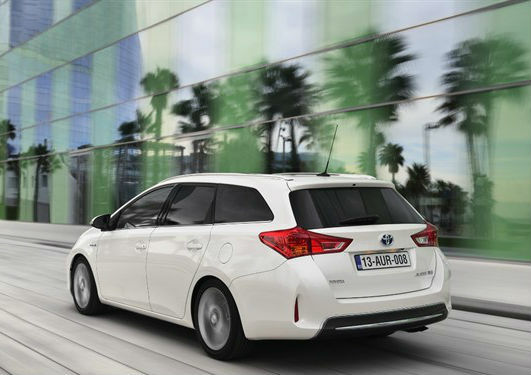 Japanese car maker Toyota, has officially revealed the pricing and specification for the British Auris Touring Sports. This is the first time that Toyota Auris has got a wagon styled body. The vehicle has been built exclusively by the Toyota Motor Manufacturing UK at its Burnston plant in Derbyshire. Making further diversification for Toyota’s Synergy Drive technology this is the first model in its class to offer full hybrid powertrain. The prices of the vehicle starts from 15,595 pounds for the Active that is available with the 1.33 Dual VVT-I petrol engine or a 1.4 D-4D diesel both of these engines will be mated with 6 speed manual transmission. The new model will be including roof rail, 15 inches steel wheels, auto single zone AC, 4 speaker radio/CD player with USB connectivity, class defining load space, 7 airbags, Hill start assistant and vehicle stability control. 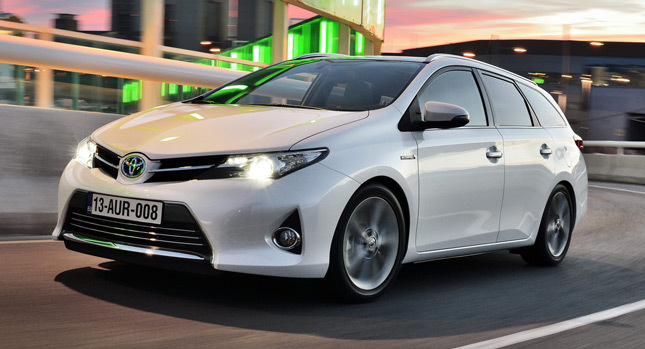 The top model of the Toyota Auris Touring Sports is Icon and is tagged with a price of 18,245 pounds. Full range of engine is available with the Icon including the 1.8 litre Hybrid system. The 1.6 litre Valvematic petrol is also available with option of 6-speed manual or multi-drive variable transmission. The extra specification over the Active includes 16” alloys, fog lamp, double level boot floor, touch screen entertainment system, Bluetooth and rear view camera. Sport Model adds sporty design to the interior and exterior and is available at the price of 19,345 pounds for the 1.6 litre Valvematic petrol. Another version with 1.4 litre D-4D diesel is available at 20,345 pounds with the highest standard specs. It comes with a 17” alloy wheel, rain sensing wipers, dusk sensing headlamps, power mirrors, seat heater, dual-zone climate control AC, smart start system, cruise control and intelligent Part assistant. There is also a complete list of accessories available with the Toyota Auris Touring Sports providing an effective way to the owners to add specs that they want. Toyota Touch and Go navigation is available with the other models also with an extra 650 pound. The intelligent part assist system is also available as an option for the Icon and Sport with extra 350 pound. Comfort packs also available that can be added with the Icon and sports grade with an extra 550 pounds.